If you're a Steampunk enthusiast, we don't have to try to sell you on this costume. But if you're not familiar, we'd be happy to enlighten you. Heroic adventures. Historical style. Steam powered inventions of limitless possibility! And that’s only the beginning. Whether you simply like the old Victorian-era look of Steampunk costumes and accessories or you are a true enthusiast, the Steampunk genre has something for everyone. The blending of Victorian-style aesthetics with steam-powered technologies makes for a look that is more art than fashion. The best part about Steampunk is that you can make it what you want. Get a base costume and bring it to life with your handmade creations or let someone else do all of the work for you – either way you’ll have a costume that makes your friends envious! 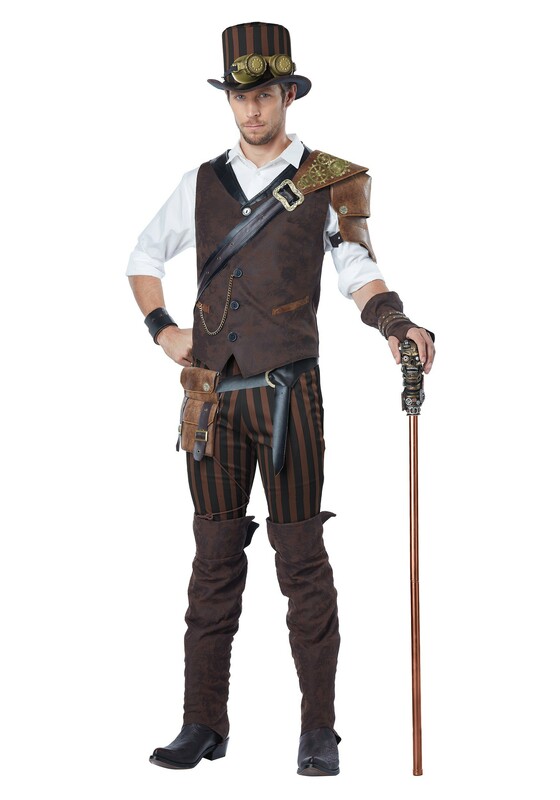 If that sounds like your kind of night out, this Steampunk Adventurer costume is most definitely for you. With the stylish bravado provided by this signature look, you'll be the guy that everyone wants to team up with. Use this costume to write a brand new chapter in history! The costume is made of 100% man-made materials and has everything you need for a complete Steampunk costume. The vest has center-front buttons with a watch chain attached to a faux pocket welt. The striped, cropped pants have an elastic waistband for a comfortable fit. The shoulder guard is made of sturdy foam and has a faux leather strap with a plastic belt buckle attached. The costume is finished off with the faux leather belt with metal buckle, faux suede boot tops, and molded vinyl goggles. Oh, and don’t forget the foam top hat - it will give you the full Steampunk look you’ve been searching for! When i first saw this costume onIine, I thought that the pictures that were advertised looked terrific, and I immediately ordered the medium size. But once the costume arrived, I quickly realized that I had been misled by the advertising. The quality is very cheap and made of thin material. Everything is fastened by velcro. The hat was so wrinkled and flimsy, I am going to need to find a steamer to try and fix it, and perhaps some cardboard to support the interior and make it stand up on my head. The vest doesn't look as great in person, the brown floral colours unauthentic. The belt is for show and doesn't quite fit, it just hangs loose - I'll try and pin it and hope for the best. Lesson learned. If it looks too good to be true, it probably is. I hope nobody else is disappointed.